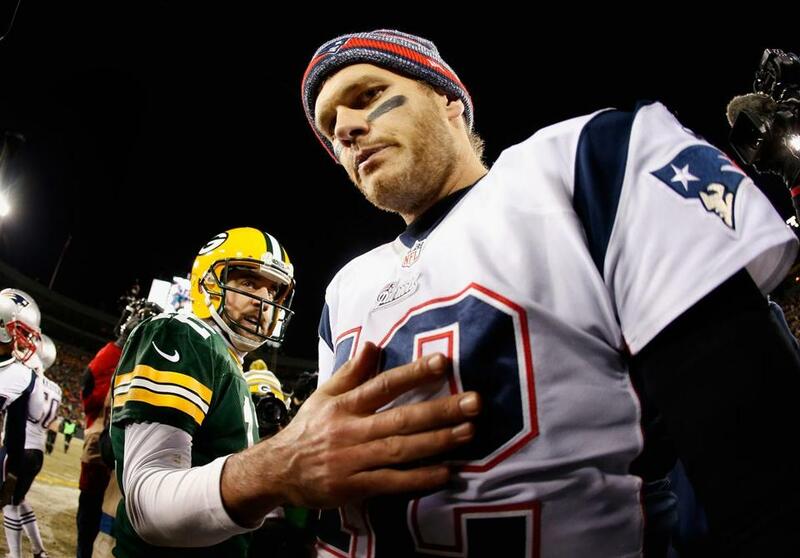 Tom Brady walked away from Packers quarterback Aaron Rodgers after shaking hands. Green Bay took a 26-21 win over the Patriots on Sunday. Patriots fans who also value sportsmanship are regularly left with things to frown about. On the field, it’s sometimes overt enough that flags fall, as they did a couple of Sundays back when Rob Gronkowski drove the Colts’ Sergio Brown, with whom he has some history, not just well out of bounds but to the ground and into the camera cart. Gronkowski seemed to think that his move, which earned him a 15-yard unnecessary roughness penalty, was just part of intense play. The NFL, however, disagreed — and slapped him with an $8,268 fine. Other times, it’s Coach Bill Belichick’s sullen moods or nano-second postgame handshakes or disdain for TV niceties like a quick on-the-field interview after losing a playoff game. But on Sunday, Tom Brady was the frown-inducer. After the Packers made a win-sealing first down, our franchise quarterback treated fans to a temper tantrum, pacing the sidelines and repeatedly yelling what was almost unmistakably the F-word. For that display, Brady is the New England Patriots poor sport of the week.